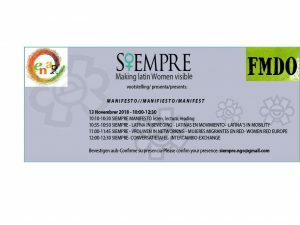 Latina´s Women in Belgium launch manifesto calling for an inclusive social participation. (Brussels, 12 November 2018) The nonprofit organization Siemprewill be launching its manifesto this Tuesday, November 13th, in the Brussels headquarters of the European Network Against Racism(ENAR) as a call for the empowerment and inclusive participation of the female Latina´s diaspora in Belgium. Siempre is devoted to creating connections among Latin American and Caribbean women settled in Europe. It pleads for building networks among activists and institutions, and also offers workshops of health, education, multiculturalism, and helps to give visibility towards the community that it represents. The discussion of the manifesto will take place in one of ENAR´s conference halls (Rue Ducal, 67, Brussels) and it will also be an occasion to celebrate the recent membership of Siempre to the host institution. Along with the statements divulgation, they will also reunite forces with their allies and they will generate a debate program that intends to uncover Siempre´s challenges and structural goals. “We work as a unified network, using our voices to make ourselves visible as migrants and as bearers of bio-aesthetic and cultural diversity. We weave a collective fabric of alliances with sisters from diverse backgrounds to provide a platform for their knowledge and empower their participation” quotes the document. In one of the fragments spread through the official Facebook account Siempre Vzw Ngo, they assure to have tasked themselves “with making Latina’s women visible, considering their different origins, cultural contexts, and labor, as well as both their formal and informal education and with recognizing their ethnic and cultural diversity”. Born in May 2017, the NGO operates with its own financial resources, works with associations of several European countries, and gains strength from the ancestral struggle of aboriginal women in Central and South America. Its name is the acronym of the mainworking areas: Science, Integrity, Empowerment, Mobility, Renewable & Educational Projects. Founded by two Mexicans, Dr. Ana Valenzuela, scientist, researcher and author; and Tamara Cruz, artist, artisan, and politician of Groen; Siemprerises as a platform to denounce the problems of migrant women. The foundation directs its emphasize towards contemporary phenomena affecting Latina women, such as gender violence, accessibility to the job market, migration and family reunification. *Yanet Medina Navarro (1990) Periodista y autora cubana radicada en Bélgica. Graduada de la Universidad de La Habana. Ex redactora de la emisora Radio Reloj y la agencia de noticias Prensa Latina. Actual articulista freelance vinculada a Radio Netherlands Worldwide y colaboradora en el área de comunicaciones para Siempre NGO.